With thin profit margins and high risks, owning and managing a towing business can be a real challenge. Mostly, these challenges come in the form of finding affordable insurance rates, ensuring safety and compliance, and efficiently managing vehicle fleets. In an effort to help, let's examine 5 benefits of electronic fleet inspections for towing businesses. Whether a towing business is required to perform Driver Vehicle Inspection Reports (DVIRs) in accordance with FMSCA Ruling 396.11 or not, electronic fleet inspection software will help businesses streamline their fleet management and daily operations. Essentially, electronic (paperless) fleet inspection software replaces inefficient paper-based inspection processes, giving towing businesses more management capabilities and visibility with vehicle inspection processes. With electronic fleet inspection software, drivers can perform pre and post-trip vehicle inspections from their smartphones or mobile devices. This data is then transferred in real-time to a centralized dashboard accessible in the cloud from any digital device, anywhere, and anytime. Efficiently managing safety and compliance is vital for towing businesses, as the nature of their work involves many risks. Not only do they need commercial insurance to cover their drivers and expensive towing equipment, but also the vehicles being towed, any passengers riding along, and any impound storage lots. In addition, the dangers of working along busy highways and roads, towing vehicles involved in wrecks, or repossessing vehicles from public or private property, makes focusing on safety and compliance essential for long-term business sustainability. Electronic fleet inspection software is designed to keep businesses safe and in compliance. From making it easier for drivers to adhere to daily inspections to providing automated reminders for compliance checks, electronic DVIRs effectively improve safety and compliance efforts. The specific license and compliance requirements will differ according to the state and county towing businesses are operating in and the type of towing equipment they're using. In general, if the gross vehicle weight rating or gross combination weight is over 10,000 pounds, towing businesses need to adhere to FMCSA DVIRand DOT compliance requirements, and if drivers are towing a vehicle over 10k pounds or driving a vehicle over 26k pounds they'll need a CDL as well. Essentially, towing businesses need to ensure compliance with federal, state, and local regulations while ensuring their drivers are in compliance with licensing and DOT requirements. Electronic fleet inspection software gives managers the streamlined tools and expanded visibility to make this happen while providing historical data for audits and commercial insurance assessments. 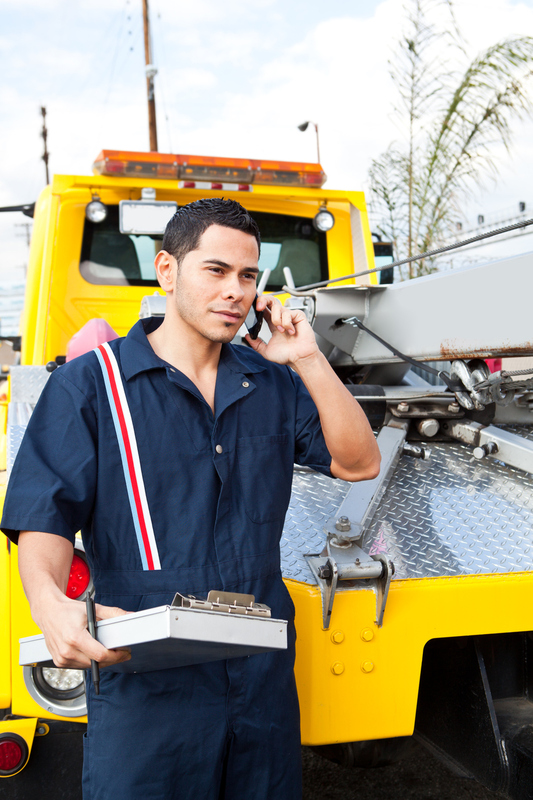 The overall quality of a towing business depends on the quality of its drivers. Their ability to speak on the phone respectfully, respond to calls in a timely manner, and safely tow vehicles, will make a huge difference with customer satisfaction and long-term business sustainability. This is why managers will benefit from having effective driver accountability tools. Electronic fleet inspections can be used by managers to ensure driver accountability with vehicle inspections. For instance, with real-time data syncing capabilities, managers will have the visibility and tools needed to hold drivers accountable with inspection and maintenance failures. Considering towing businesses must be available 24/7, managers will benefit by being able to see the exact details concerning their drivers, vehicles, and equipment in real-time. They need the ability to make sure DVIRs are being comprehensively filled out, in order to ensure drivers have the right equipment, vehicles are being properly maintained, compliance requirements are being kept, and drivers are properly licensed while on the road. Whether towing businesses have one or multiple vehicles in their fleet, electronic fleet inspection software can help them streamline daily operations. From giving drivers the ability to complete DVIRs easily from their smartphones to giving managers the tools to automate the creation of work orders from inspection fault triggers, electronic fleet inspection software effectively improves operational workflows. Electronic fleet inspection software will help streamline operationsboth directly and indirectly. For instance, it'll directly quicken inspection processes with real-time data syncing while indirectly reducing maintenance costs by ensuring inspection and schedule adherence. Like all businesses relying on fleet vehicles, operational bottlenecks occur for towing businesses when vehicles break down or become non-operational due to unforeseen mechanical or compliance failures. Electronic fleet inspection software helps businesses avoid these unforeseen failures by making DVIRs a viable task to complete within daily workflows. Managing a multiple vehicle fleet efficiently can be a challenge for towing businesses, especially if their dispatch and managers have limited operational hours. Keeping track of maintenance schedules, compliance requirements, onboard equipment, repairs, driver qualifications, vehicle registration, and other fleet details can easily become unmanageable for managers using paper-based DVIR processes. Electronic fleet inspection software alleviates these organizational challenges by centralizing fleet management into one dashboard interface accessible in the cloud. This gives managers the remote capabilities needed to manage their vehicle fleets 24/7, as well as the cloud tools to streamline repairs, gain visibility with inspection processes in real-time, ensure proper maintenance, and store inspection details for audits and strategic development. With over 43k towing businesses operating in the U.S., the competition is thick for owners to share in the $7 billion automotive towing industry (IBISWorldstats). In addition, thin profit margins, high insurance costs, and the need to maintain and repair expensive equipment are all challenges towing businesses must overcome to make a decent profit. Essentially, towing businesses need to leverage their potential by improving the performance of their vehicles, equipment, and drivers. Electronic fleet inspection software helps accomplish this by giving managers and drivers the viable tools needed to optimally manage and utilize fleets in daily workflows. This will help towing businesses ensure vehicles and equipment are properly maintained, repairs/replacements are streamlined for quick turnarounds, drivers are properly licensed and insured for compliance, and the proper equipment and vehicles are dispatched for calls. Overall, electronic fleet inspection software helps towing businesses leverage the potential of their fleets and drivers by streamlining inspection processes and expanding operational capabilities. This works to improve the performance of drivers and vehicles by reducing risks and creating viable methods for continual workflow improvements. The thin profits and high risks involved in the towing industry makes electronic fleet inspection software the perfect solution for towing businesses. This digital improvement will streamline their DVIR processes while expanding their fleet management capabilities, effectively reducing risks, ensuring compliance, and improving fleet and driver performance. The good news is cloud-based fleet inspection software integrates seamlessly with enterprise systems and is easy-to-use and manage within daily operations. This gives towing businesses a viable option for improving compliance and the bottom-line. If interested in learning how Whip Around can help please contact us today.